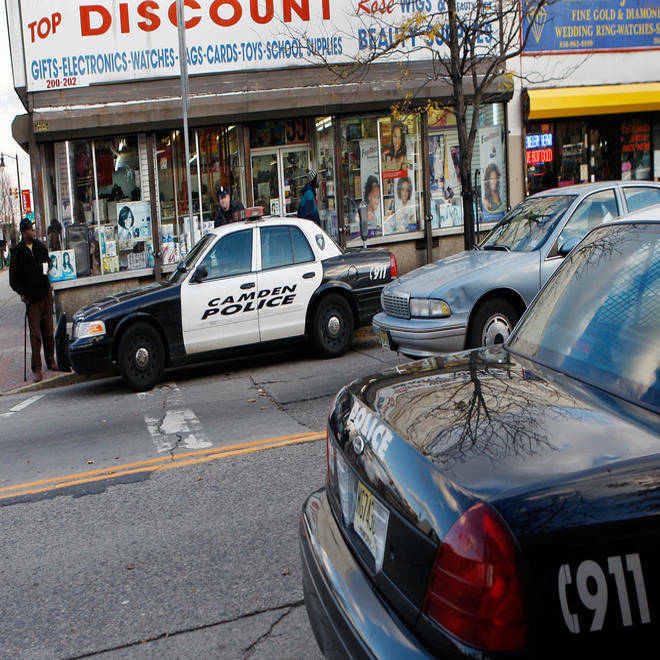 Police are seen in a downtown shopping area in Camden, N.J.
One of the most dangerous cities in the U.S. is getting rid of its police department. Amid what they call a “public safety crisis,” officials in Camden, N.J., plan to disband the city's 141-year-old police department and replace it with a non-union division of the Camden County Police. Given Camden’s exceptionally high rate of violence (the city recorded this year’s 41st homicide earlier this month), city police officers in danger being laid off say the transition is risky at best. Afflicted by homelessness, drug trafficking, prostitution, robbery and violence, Camden has consistently ranked high among the top 10 most dangerous cities in the U.S. since 1998, according to Morgan Quitno Press, a research firm that compiles statistical data on cities. In 2010, Camden had the highest crime rate in the U.S., with 2,333 violent crimes per 100,000 people, more than five times the national average. Camden Mayor Dana Redd underscored the importance of the new, regionalized police force in her proposal for the next fiscal year’s budget. Baltimore officials are considering plugging budget deficits by selling advertisement space on the side of fire trucks. NBC's Gabe Gutierrez reports. Layoffs of the city’s police force will begin by the end of the month, according to the mayor’s office. County officials said that at most 49 percent of the city’s police officers, based on an application process, will be transferred to the new county division under the plan. Gabriel said the terms of contract for current officers of the city's police department, which include longevity bonuses, day-shift differentials and other costs, make it too expensive to transfer all of them to the new force, so the rest of the Metro Division will be staffed by new hires. Louis Cappelli Jr., director of the Camden County Board of Freeholders, told NBC News that more than 1,500 people from various states and police backgrounds have already applied for the county positions. The new division, to be fully funded by the city of Camden and the state of New Jersey, will begin field training on the streets as early as October for a period of 17 to 19 weeks. But no matter how long the training, Rockefeller Institute Director Thomas Gais told NBC News that consolidating into one system and increasing cost-effectiveness takes time. Gabriel said that cities within Camden County have the option to cede their municipal police force to a county department. Union officials argue that Camden's move is a way for the city to get out of collective bargaining with police. The county's new metro division officers will be non-union members. The police department in Camden has been under state control since 2005, when then-mayor Gwendolyn Faison called for the takeover. The agreement is set to expire at the end of the year, and New Jersey Gov. Chris Christie has thrown his support behind the transition to county control. Other state officials have backed similar initiatives. A 2011 report by the Major Cities Police Chiefs Association, a group representing the nation’s 63 largest police forces, found that 70 percent were consolidating some law enforcement functions to compensate for recent budget cuts. Faced with mounting costs and declining revenue, the city of Midvale, Utah, was forced to merge four local police agencies with the Salt Lake County Sheriff’s Department. In Pennsylvania, the state police are increasingly taking on more patrol duties following the recent closures of municipal departments. Since 2010, at least 33 cities scattered throughout the state have closed or scaled back their agencies, according to state records. Police agencies in Oakland and Detroit have raised concerns about their ability to respond to routine resident burglaries, theft, and public nuisance calls because they were stretched too thin providing support for other agencies. “We’re seeing the economy do a lot of different things to the agencies, which are looking at various forms of consolidation, all of which is driven by the economy,” Melekian said, adding that he knows of at least 100 police agencies around the country undergoing some form of service consolidation. Cities that have made the switch from municipal to county or regional forces have reported saving millions of dollars and passing grades on the street, but Melekian said a shakeup of the current system in Camden won't eradicate crime or solve budgetary woes.